Cozy Chicks: I'm bloomin' happy! 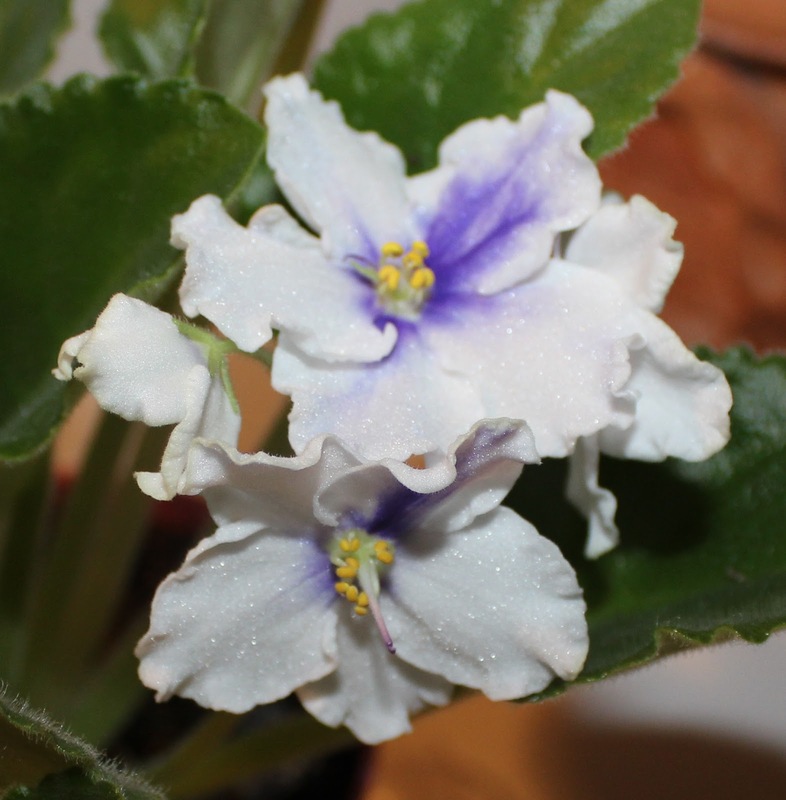 When my mother was in hospice, every day the staff watered the African violet I brought to brighten her room. The longer it was there, the sadder that little plant became--but it didn't stop blooming. At the time, I didn't know a thing about African violets so didn't know to say, "Cut that out!" My Mum LOVED her African violets and I don't remember a time during my life that she didn't have three or four of them. They were usually an impulse buy at the grocery store. After she died, I went back to the hospice home and picked up her things. I saw the African violet sitting outside, nearly dead, and ready for the trash. I took it home and nursed it back to heath, and several months later, it started to bloom--and bloomed continuously for TWO YEARS. Mr. L and I went to Florida last winter to play snowbirds. (Not entirely successful. We won't be doing that again.) I took that little violet with me. You see, it was still blooming. It traveled in the back of our minivan behind the cats and all we thought we'd need for a three-month stay. It lost a few leaves, but it didn't stop blooming. Meanwhile, back at the ranch, my brother was taking care of the rest of my plants. Every week I'd ask if he was watering them, and he'd turn on Facetime and take me on a tour of the plants. He only killed one violet (over watered) but two of our mother's orchids bloomed while we were away. While in Florida, I suffered a terrible bout of writer's block and was very unhappy, but that little violet sitting on the kitchen counter was a reminder of home. The place we were staying at was not conducive to writing, so I watched a LOT of Youtube videos, including how to keep your roses and African violets healthy. I decided to test out one of the things I'd learned and "fertilized" the violet using the natural ingredients from the peelings from my green smoothies. Um...it may have been too much, for the violet went from blooming into immediate leaf production. I was so sad all summer long when it just did not want to bloom. Not a lot so far, but I'm hoping for more on this second violet. It's rather hard to see in this picture, but that flower is a very pale pink. 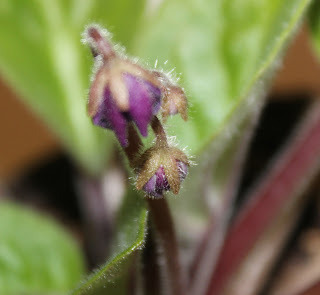 Your standard purple violet getting ready to bloom on a third violet. Meanwhile, my own three violets stubbornly refuse to bloom.. I've never been very successful at keeping houseplants alive -- until I took in my mother's plants. They give me so much pleasure because I know she loved them. She'd be happy knowing that after more than two years all but one of them is still alive and happy. Have you got house plants? If so, what are they?